FARSCAPE returns in a brand new comic series thanks to a just-inked licensing agreement between The Jim Henson Company and BOOM! Studios. Widely recognized as one of the greatest sci-fi series in television history, the multi-award-winning FARSCAPE will make its comic book debut later this year. "FARSCAPE took science fiction television to a new level and ushered in a whole host of shows that wouldn't have been possible without FARSCAPE's pioneering. As a long-time 'Scaper', I am incredibly excited to mine the dense universe of FARSCAPE for new stories and adventures in comic book form," said BOOM! Marketing and Sales Director, Chip Mosher. "I watched the show as it came out, I bought the DVDs the day they hit the shelves, and I can't frelling wait to publish these comics!" 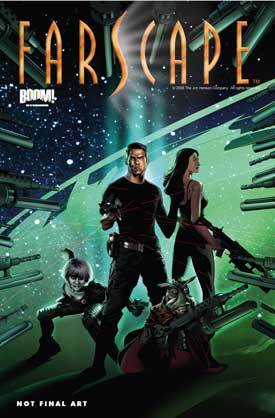 The FARSCAPE comic book series will be taking advantage of the upcoming webisodes to be produced by The Jim Henson Company in association with RHI Entertainment for SCIFI.COM. 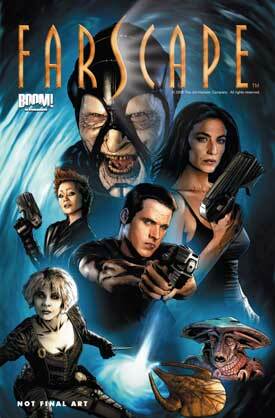 The webisode series will re-unite FARSCAPE executive producer Brian Henson with creator Rockne S. O'Bannon. "It's so exciting to work with BOOM! Studios on this project knowing that their team members are true fans of the show," said Brian Henson, co-CEO of The Jim Henson Company and executive producer of the original Farscape television series. "Working with one of our favorite comic publishers, we know our loyal supporters will enjoy these original adventures while new audiences will have a fantastic introduction to the FARSCAPE universe." Debuting on the SCI-FI Channel in 1998, FARSCAPE follows the adventures of Astronaut John Crichton as a freak accident during an experimental space mission catapults him across a thousand galaxies to an alien battlefield. Suddenly, he's trapped among alien creatures wielding deadly technology - a battle that 20th century sci-fi pop culture never prepared him for. Hunted by a merciless military race, Crichton begins his quest for home from a distant galaxy.